The Manship Artists Residence + Studios property was once at the center of an important art colony that hosted some of America’s greatest sculptors and other artists. This property is a rare survival from a former time that represents generations of artists who have come to Cape Ann. Paul Manship, his son John, and daughter-in-law Margaret Cassidy shared a love for this special place. They embraced the Village of Lanesville as a haven where they came to connect with family and friends, to restore themselves and be inspired, to create new work, and ultimately, to make their home. Why did artists come to Cape Ann? Paul Manship was one of the most famous American artists of the first half of the 20th century. He was the youngest fellow ever awarded a Prix de Rome in 1909 – the highest honor accorded artists at the time. Considered the pioneer of American Art Deco, Manship returned from his fellowship at the American Academy in Rome to become one of the most sought-after artists in the US, defining American sculpture for over two decades. His work is all over NYC and among the most prized possessions of major museums. John Manship created his own residency abroad as an itinerant painter, traveling throughout Europe following his graduation from Harvard in 1948. He settled in Rome for a time and later New York City and Gloucester, MA. John was a prolific painter, often painting two or three paintings a day. He described himself as a "portraitist of places" and was especially found of painting his Cape Ann surroundings. Following his father's death, his wife Margaret encouraged him to also take up sculpture. Margaret Cassidy won an international sculpture contest that offered her a three-year fellowship at the Villa Schifanoia in Fiesole, Italy. While there she began an association with master sculptor Antonio Berti, with whom she studied and assisted for several years while working on a sculpture for St. Peter’s Basilica in Rome and other major monuments in Italy. Primarily a sculptor, Margaret also developed new techniques for working with stained glass. She was an avid archivist as well. Chou Chou, the daughter of Paul Manship, was brought up in an artist's family that valued hard work and craftsmanship, as well as good food and wine. She studied at the Art Students League in New York and much later at Sacramento State College. Her paintings show the tension of movement in bodies -- expressing their three-dimensionality is important to her. 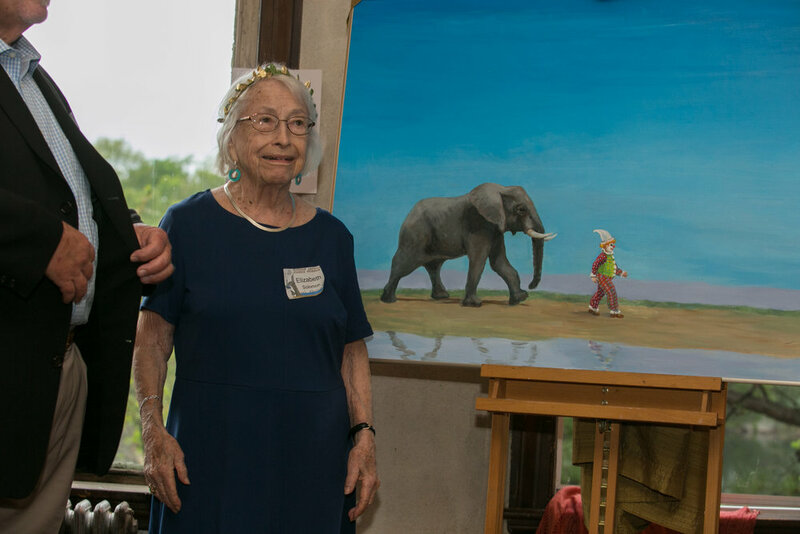 In August 2018, Elizabeth travelled from her home in California to present a gift of her painting "Nature Walk" to the Manship Artists. Her sons Peter and Tom, with her granddaughter Isabel, and her daughter-in-law Cheri accompanied her to the unveiling and celebration of the launch of the Manship Artists. Elizabeth literally passed the torch to the next generation of “Manship Artists” and the first cohort of visiting artists at Starfield - Barbara Bosworth, S. Billie Mandle, Abelardo Morrel, and Justin Kimball. MARS board and the community are so grateful for the support of the Manship and Cassidy families.